Growing up, Sundays always sounded like church and smelled like food. When I lived in Port-au-Prince, Haiti, it sounded like church bells ringing over the mountains of Petionville down into the streets of the Delmas, and It smelled like diri djon djon cooking on the stove. In Fort Lauderdale, Florida, it sounded like a Haitian choir rising into a joyful noise over an accordion followed by the smell of after mass pate morue being sold in the parking lot followed by legume at my house. The scent that tied together all the places I grew up, and every city I’ve grown in since then, is the scent of épis frying in oil to be the base of everything. It became my common denominator and my touchstone. Epis and my mother’s pilon—and eventually my pilon—became both my root I and my wings. 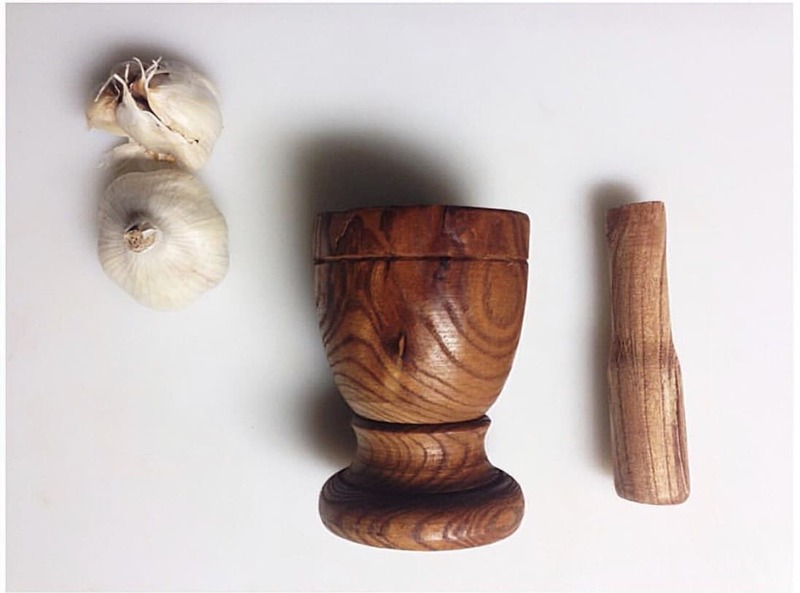 A pilon is the Haitian Kreyol word for mortar and pestle, most of which are wooden with carvings deep into the sides. They’re used to make épis, the spice base of pretty much every Haitian savory meal. Epis is to Haitian food, as sofrito is to Latin cooking, or mirepoix is to Creole cooking. My mother’s recipe was simple, and like most of the Haitian recipes I’ve ever learned, there were no measurements. I would walk into the kitchen and find; garlic, scallions, scotch bonnet peppers, maggi, and oil on the counter next to her beautifully carved pilon, and with a point of her chin I would know that this was my part to play in the orchestra of dinner. On those Lauderdale Sundays when stars would align and both my mom and my pops would have the day off, my pops would blast kompa music from his truck and invite the neighborhood to two-step with us. He would interrupt whatever novel I was trying to read and send me to “help” my mother in the kitchen. I would make the épis and sneak off, never staying to learn much else, only coming back once it was time to make my plate. When I was a 17-year-old college student in Tallahassee, who was expected to start feeding herself, I bought a cookbook. My entire freshman year was spent making rice that I just couldn’t get to cook all the way through, and cuts of meat too tough to chew. Looking back, I can’t pinpoint exactly when I started cooking Haitian food. At some point, after the devastating earthquake hit Haiti, I started contemplating how that aspect of my culture could disappear into the rubble and I wouldn’t be able to meld the pieces within myself to pass something recognizable to the next generation. I started thinking of my mother, who spent hours working manual labor to come home and pour love into a pot to serve up a plate. I thought of my sister, just two years older, but had to grow up much earlier than I did as a first-born daughter, the one who fed me in college, even though her eyes roll as my cooking fails wasted groceries. I started calling my mother in the middle of Winn-Dixie to ask what ingredients I should buy, and calling during the process to see if I was on track. I started to cook to connect, and I kept cooking as a way to share culture with folks that look like me and may come from, and have grown in different places from me. “Where are you from” is a loaded question for the Black diaspora. It’s a question with different answers depending on who asks it, and what they really mean. When a Black person asks me where I’m from, it feels like a search of kinship to assign to our interaction. The silent intonation is always; “What kind of Black are you?” The older I get the more comforting this question is, it’s like a diaspora call and answer, an opportunity to see how vast we are. For my younger self, who had the thick Haitian accent, and uniform clothes that my seamstress mother sewed herself instead of buying from the store, I ran from the question and its many meanings. Being a young Black immigrant is a masterclass on balance and transitions, and I was not a good early student. In my younger days, I spent a lot of energy of trying to make myself as small as possible to fit inside of everyone else’s expectations of me. A lot of that was a wasteland of attempts to always be the “right kind of black” for any environment. It’s an exhausting and useless endeavor to cut off pieces of yourself until you become some swaggerless shadow, echoing the group that allows you to sit with them that day. A lot of the learning happens before we have the language to describe it. We share more than the commonalities of our trauma. We share food history. We share percussion. We share rhythm. And these commonalities exist across the pathways that blackness has stretched across the world, molded every generation by those who put in the work to keep traditions alive and add themselves in to keep it forever evolving. I do my part with my own pilon, and on Sundays, I put in; garlic, scallions, scotch bonnet pepper, maggi, and oil, I get to mashing, and it always smells like home.